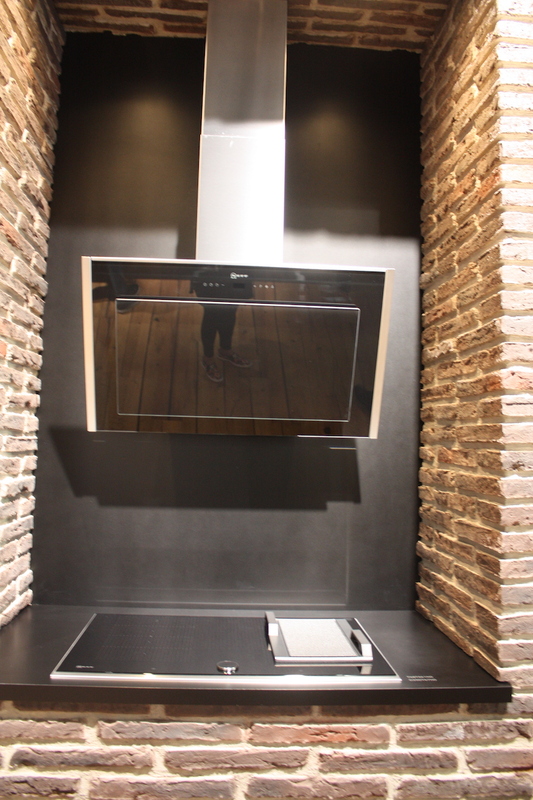 Kitchen hoods and venting might not seem like the most exciting part of a kitchen upgrade, but Homedit was very enthused by all the new designs shown at EuroCucina in Milan. 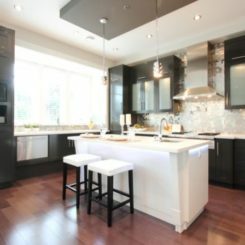 From traditional style vented hoods, low profile wall mounted models and ductless varieties that look more like a lamp than a vent, many stylish options exist for making sure your cooktop or range is properly vented. 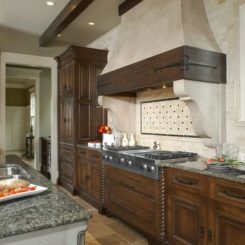 Down draft hoods ventilation systems have been around for a while, and have most often been a built in part of a cooktop. Now, you can choose from traditional downdraft vents or those that can be automatically raised up and out of the counter when needed. 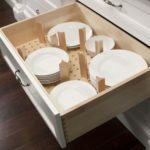 When not in use, they retract into the counter, leaving a flat surface. 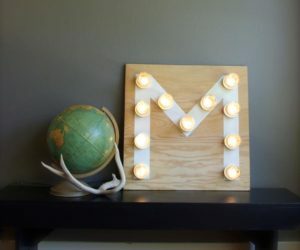 Some also come with a light included. 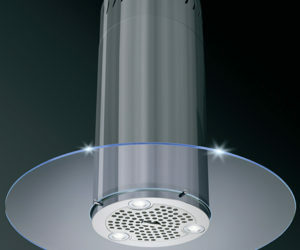 This retractable kitchen vent from Airforce includes a light. 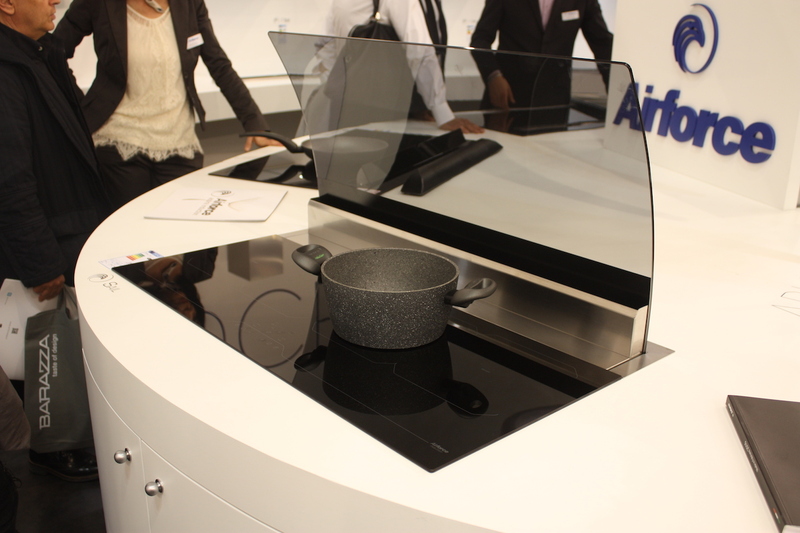 Another retractable model from Airforce includes a glass screen that protects surfaces or people on the side opposite the cooktop. 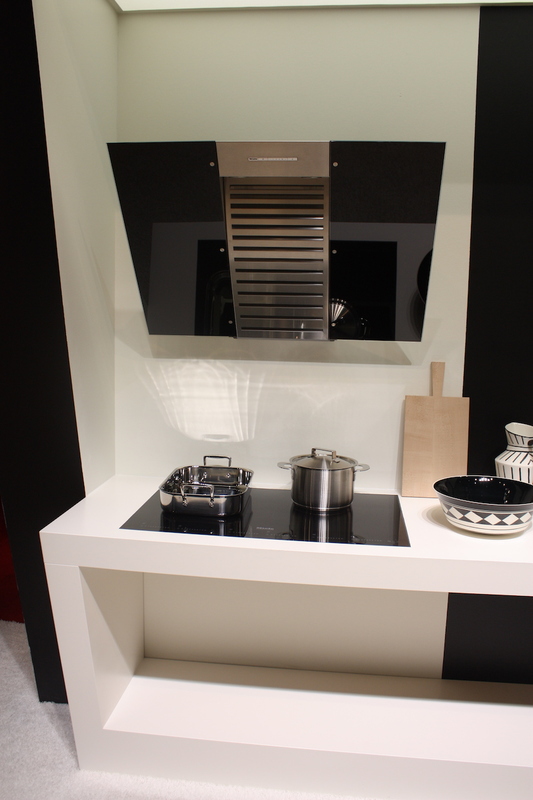 A more traditional style of downdraft vent is this one by Cucine Lube. 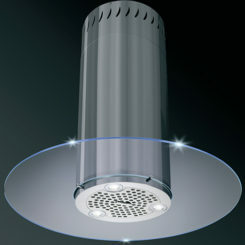 This type of vent is particularly well suited for the new linear style of burner configuration. 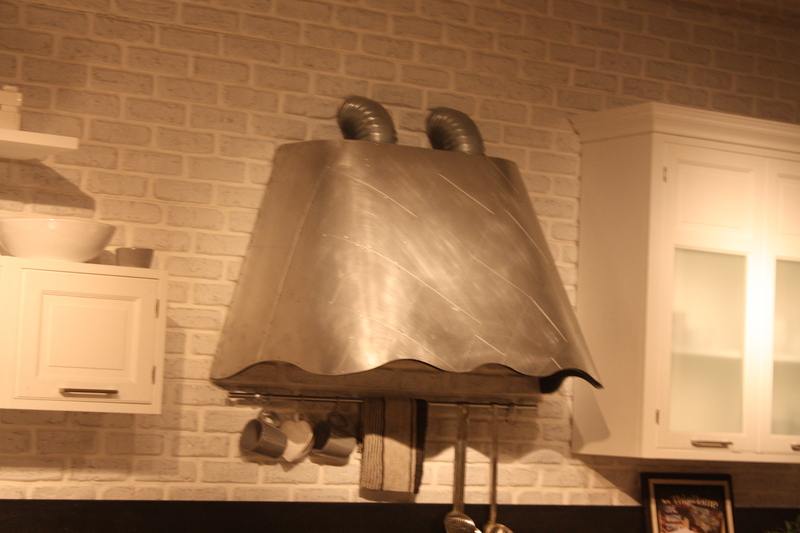 One of the coolest trends is that of ductless kitchen hoods that look like a lamp. 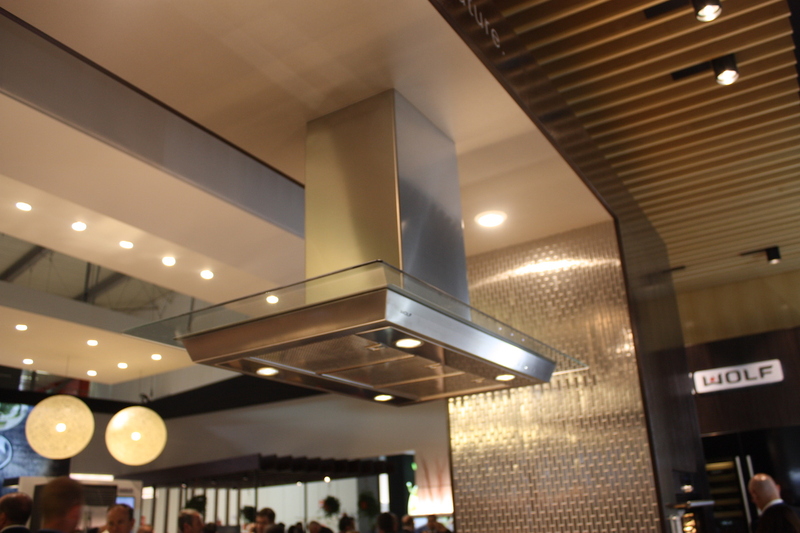 This is a very stylish option if you can’t or don’t want to have a traditionally vented kitchen hood. 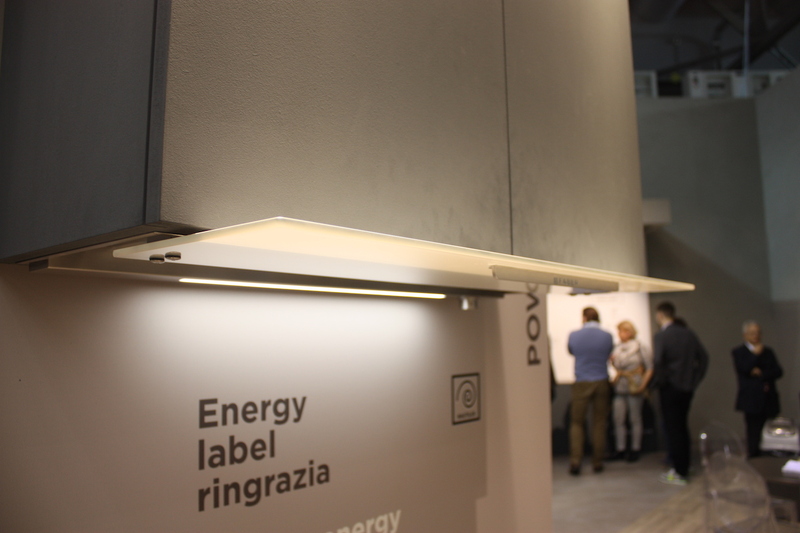 Elica has been producing stylish kitchen hoods since the 1970’s and offers options of ductless lamp-style hoods in all sorts of designs and configurations. The options pictured here include the Star model on the right, whose hundred of glass prisms enclose a 300 CFM blower. 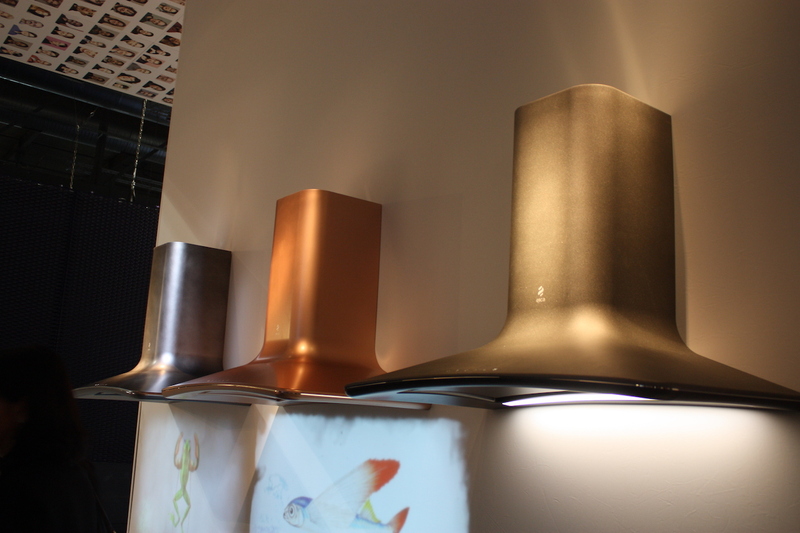 The Airforce stand displayed many lamp-style kitchen hoods, such as these three. 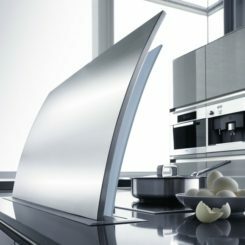 Large and shiny, the high gloss of this kitchen hood makes it perfect for a glitzy yet minimalist kitchen. 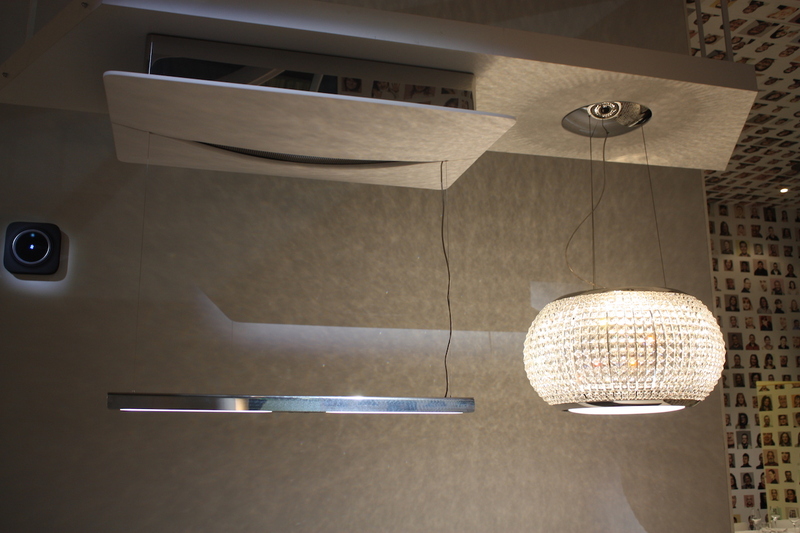 The same high gloss on a shallower fixture provides a completely different feel. 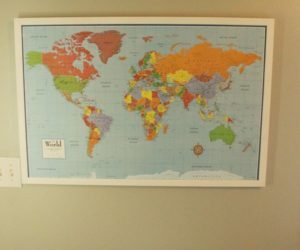 This would be fit well in a more casual kitchen setting. 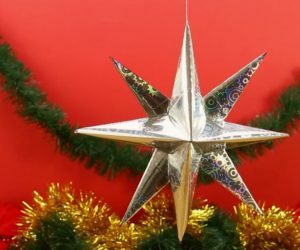 Elica’s Star is made of shimmering stainless steel and glass. 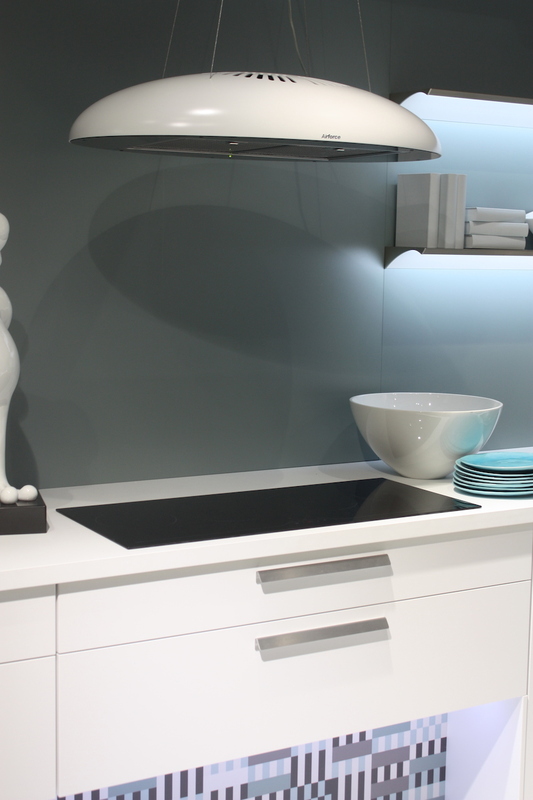 This sophisticated design is great for a modern kitchen as well as a traditionally styled luxe kitchen. 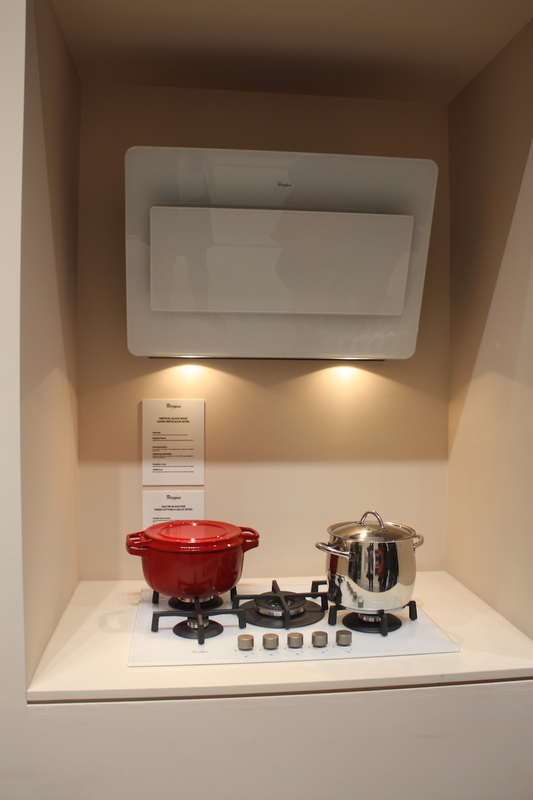 This wall-mounted ductless kitchen hood from Elica casts a nice, warm light that will cozy up any kitchen. 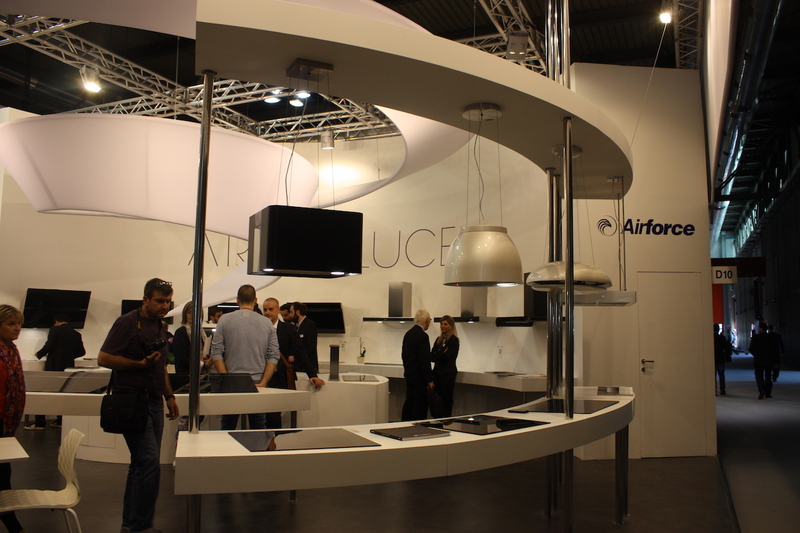 Nobilia featured this “Eclipse” range hood from Airforce, perfect for an induction cooktop. 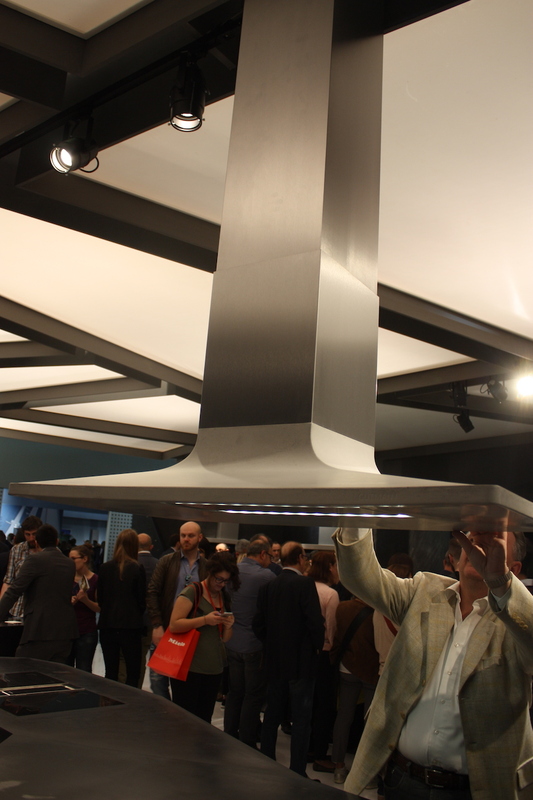 This stylish kitchen hood from Falmec looks especially like a lamp. 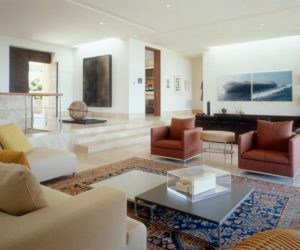 The oblong shape of the design works best over an island. 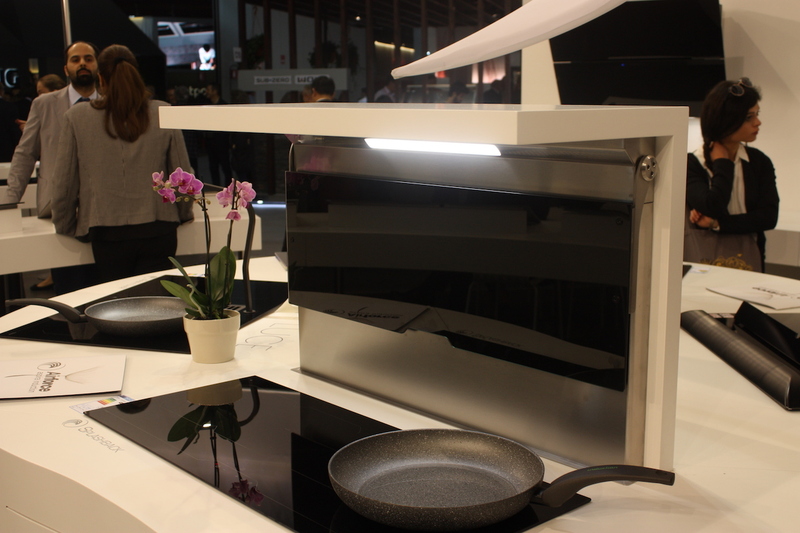 Hoover’s lamp-like kitchen hood includes LED lights around the perimeter. 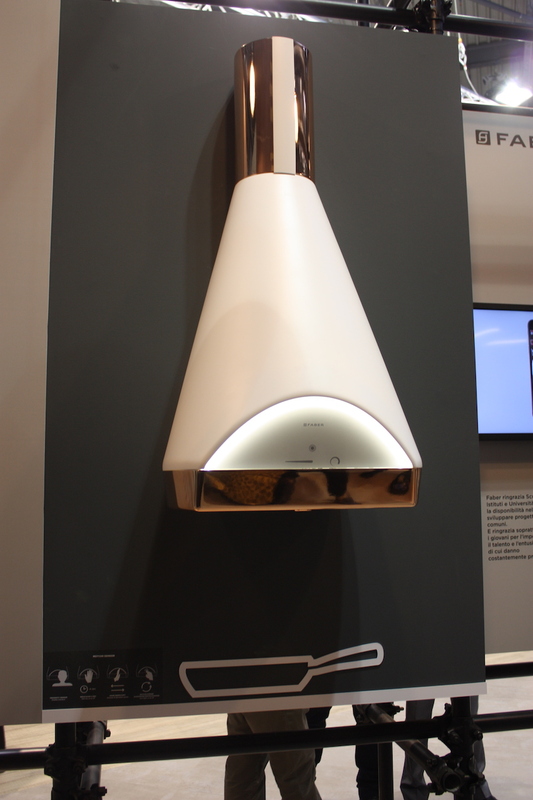 The traditionally vented box hood from Faber includes a light as well as special technology to purify the air as it filters. 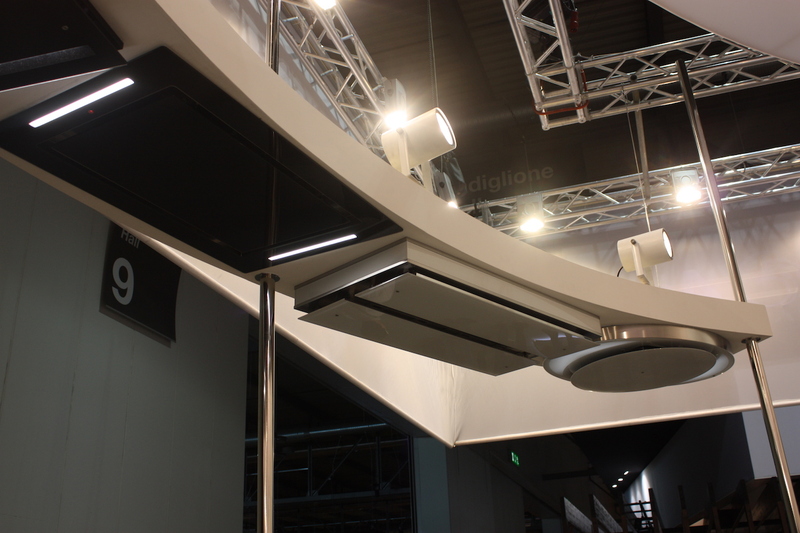 Arrital’s box-shaped kitchen hood includes not only lights, but also the exhaust hood, a motorised concealing system and shelves. 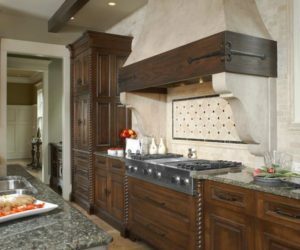 A kitchen that is tight on space, or that has a lower ceiling that will not accommodate a large vented kitchen hood is the perfect setting for a flush-mount hood. It’s important top remember that a flush-mounted hood still need to be located properly to actually vent the cooking space. 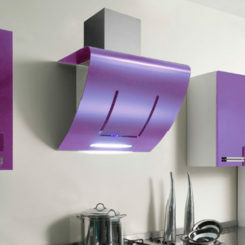 This three flush-mount kitchen hoods are modern and stylish. 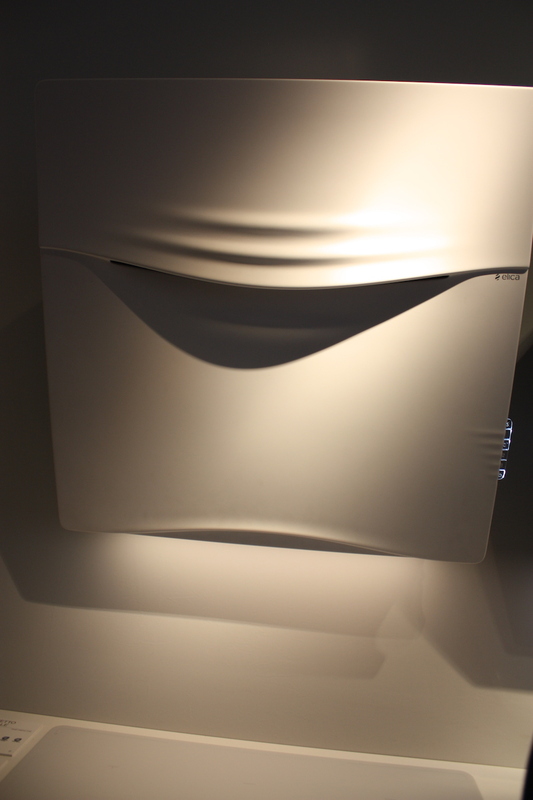 They’re also perfect for homeowners who do not want the kitchen hood to have a highly noticeable profile. The models are, left to right, the F174, F176 and Elitto. 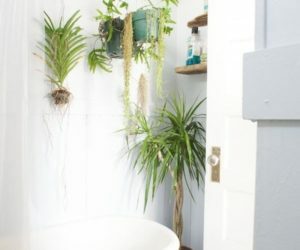 While wall mounted hoods are the most common standard style, new designs — both vented and ductless — are sleeker and more low profile than the older types. Square, round, angular or colorful, these kitchen hoods take up less space but are no less dramatic. 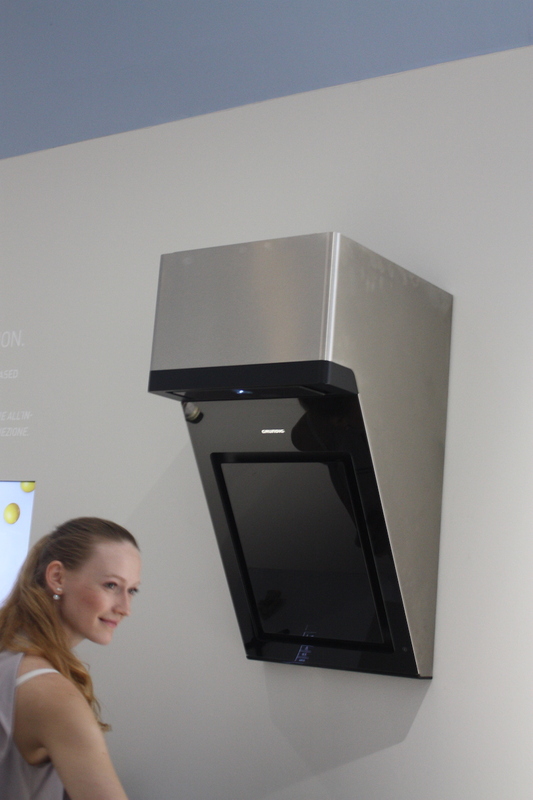 Arrex Cucine’s display included this black wall-mounted range hood by Faber. It’s sleek black waves are reminiscent of a swimming manta ray. 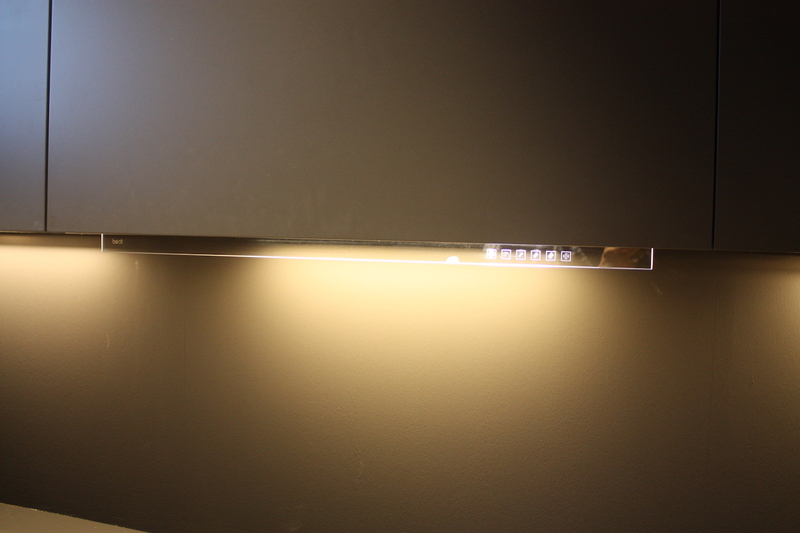 Elica’s wall model with a rippled lip is sleek and unobtrusive, yet still interesting. 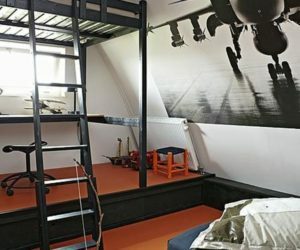 The F186 from Airforce is a wall-mounted unit with a glass panel on the front that lifts up to expose the air circulation mechanism. 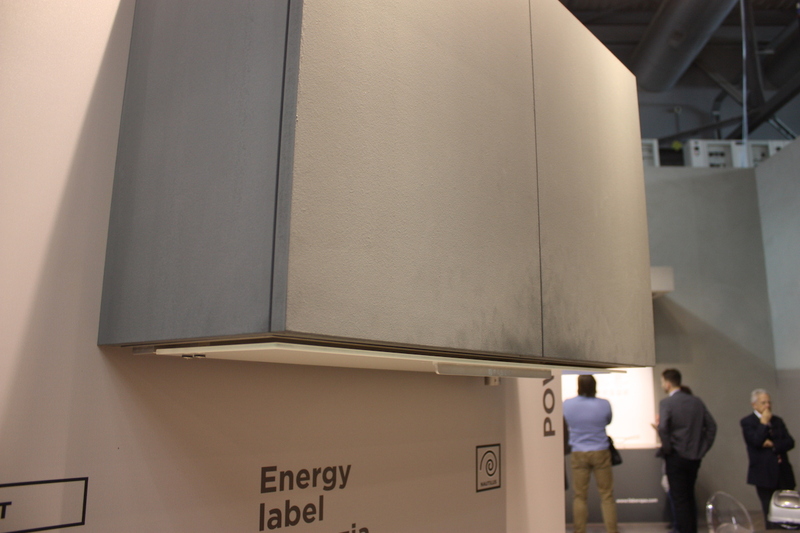 Best range hoods has a variety of wall-mounted, modern range hoods, including this one that sports a plaid-like pattern. 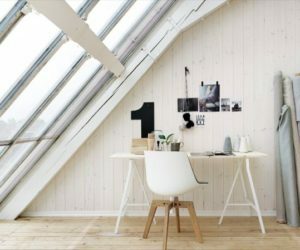 Whirlpool’s modern, white model is compact and lighted. 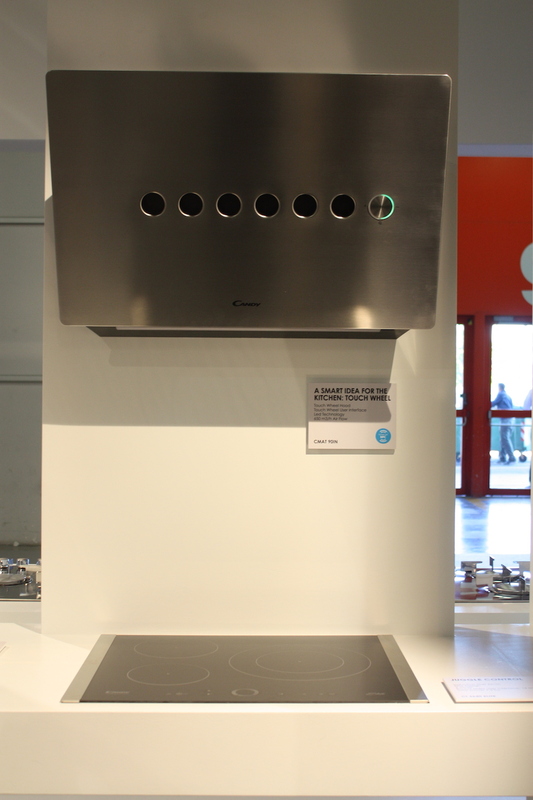 Neff’s wide range of cooktops can be accompanied by their line of range hoods, like this glass vented model. 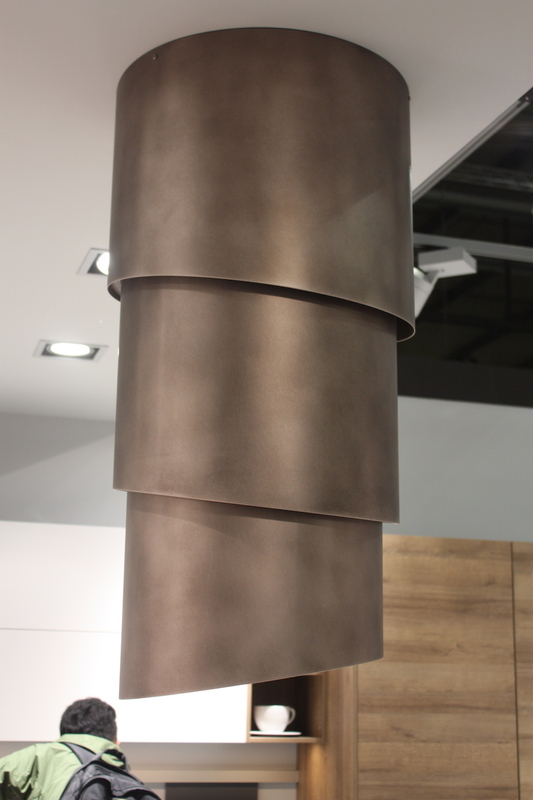 Falmec’s “Prisma” hood is highlighted by a textured panel that adds style to the fixture. 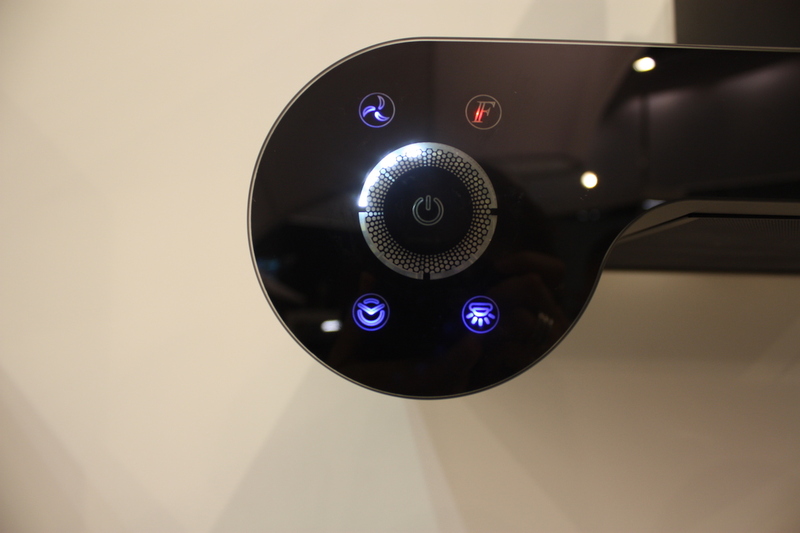 It features push-button touch, LED ambient light and a removable, washable filter. Candy’s Eclipse hood is also based on a round design, but with an ample duct and a built-in light. 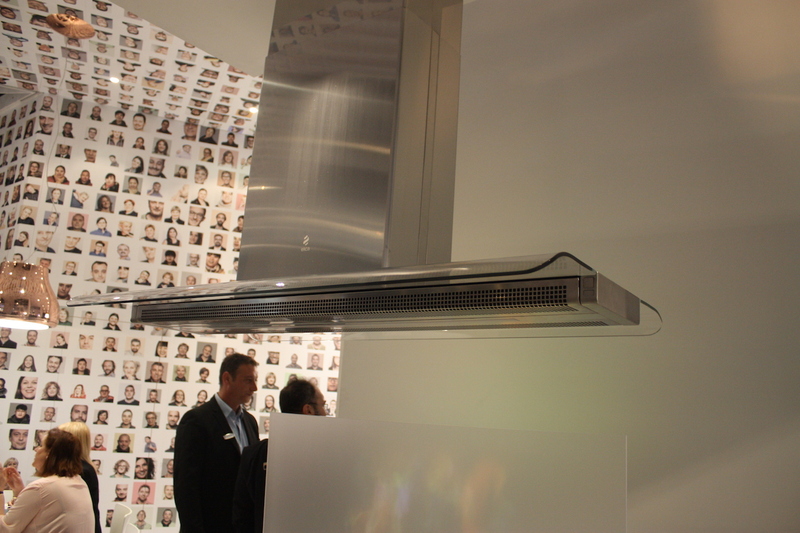 Touch wheel technology controls Candy’s stainless steel vertical wall-mounted range hood. 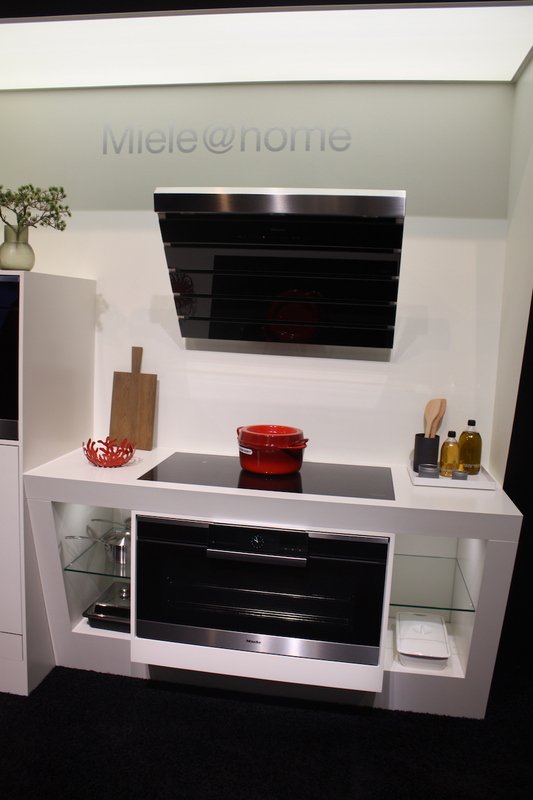 Miele’s version is a luminous, modern hood that lights as well as vents your cooking space. 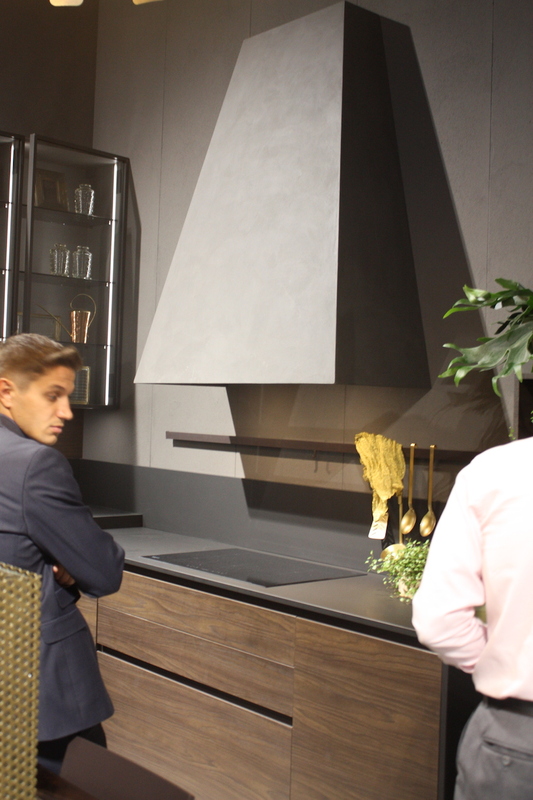 At EuroCucina in Milan Faber showcases these very low profile hoods in a variety of finishes with a digital control panel. 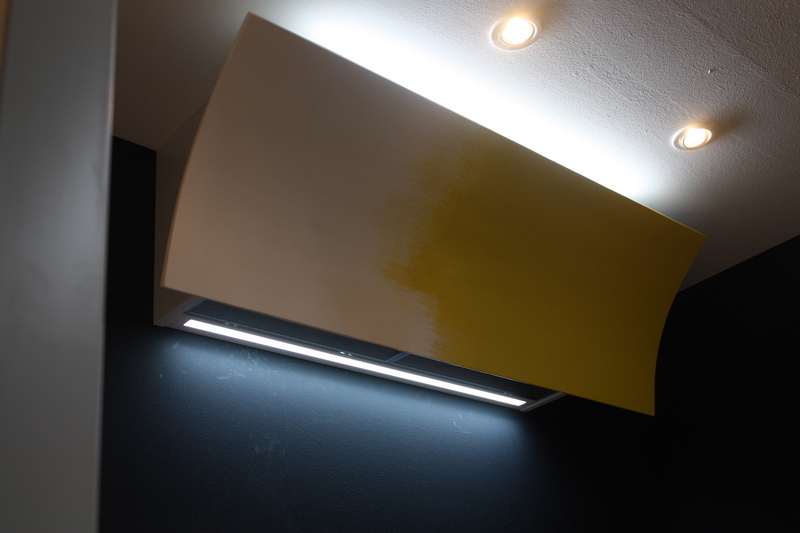 This one has a light hued finish. 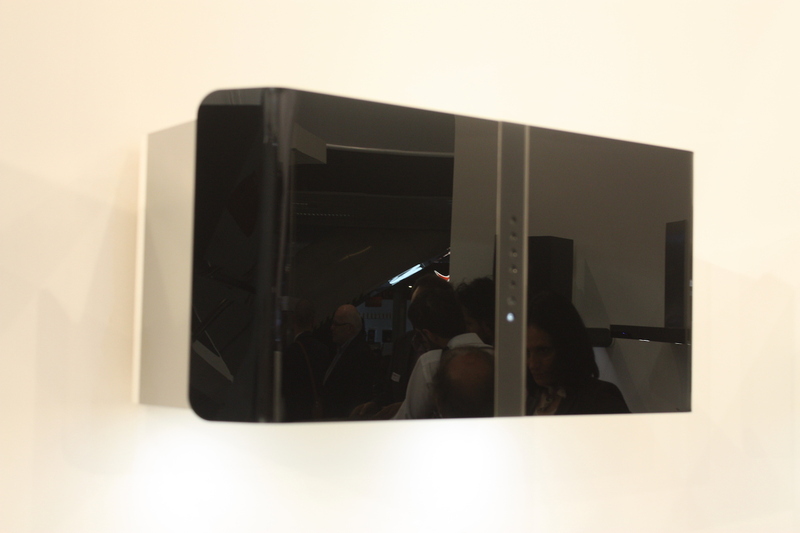 Miele also presented this version with a face made of glass slats. 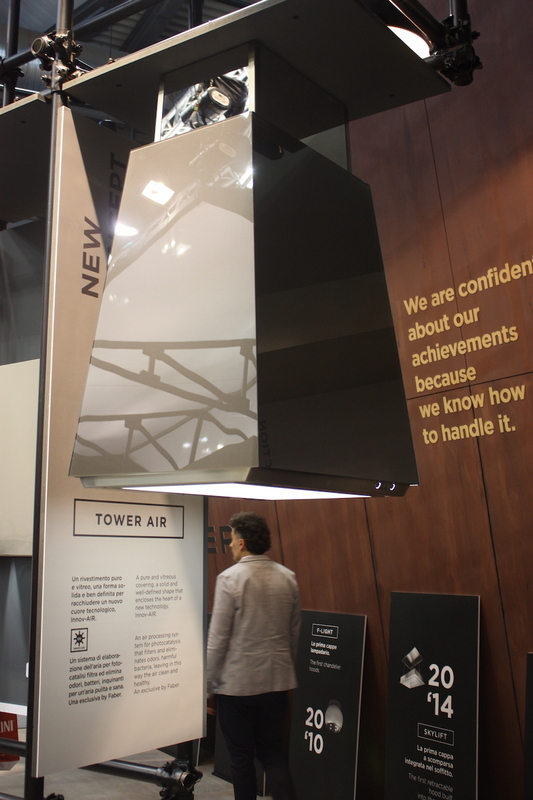 They also displayed this flat glass version with a central vent panel. 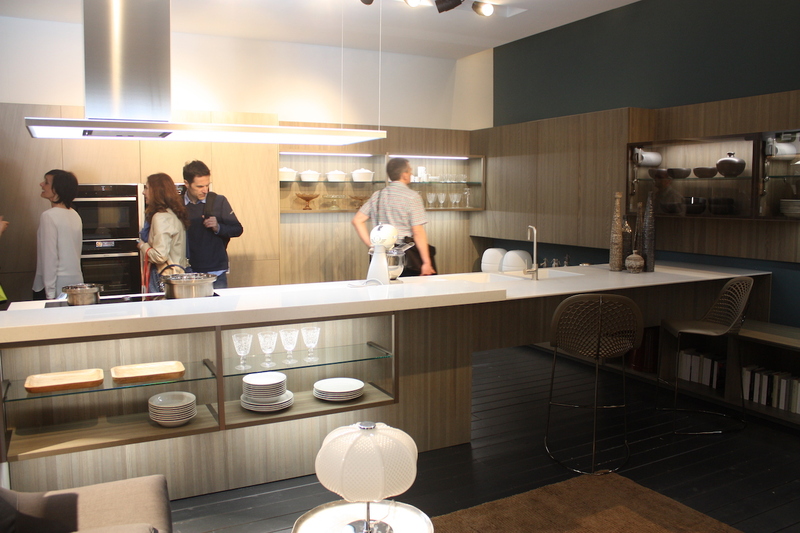 Filmed also presented its glass-slatted hood that has a graceful curve from the top to the bottom. 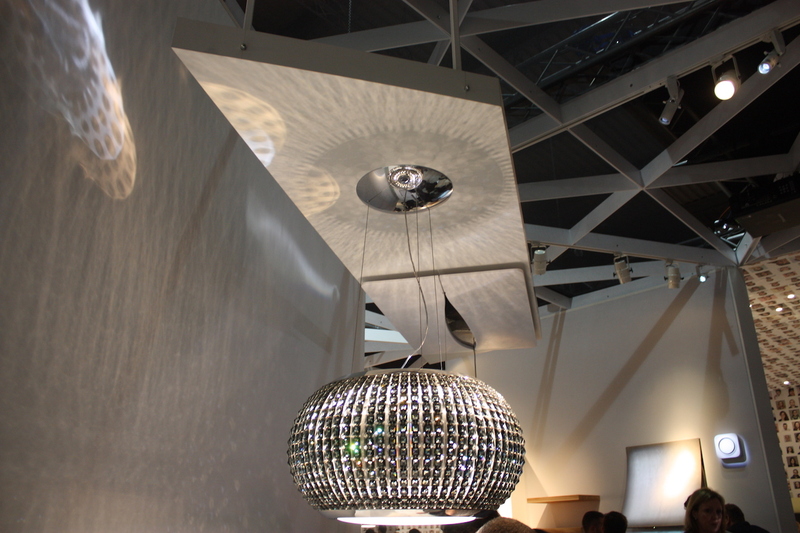 The diced model also includes a light. 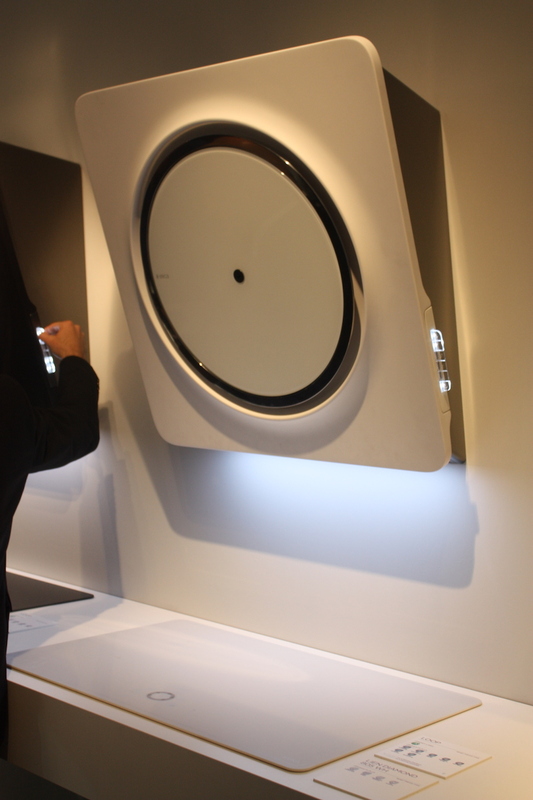 Indesit’s wall-mounted, ductless hoof has a high tech look, enhanced by a lighted feature. This curved style kitchen had from Falmec would be perfect for a tighter kitchen space, thanks to its low profile that hugs the corner. 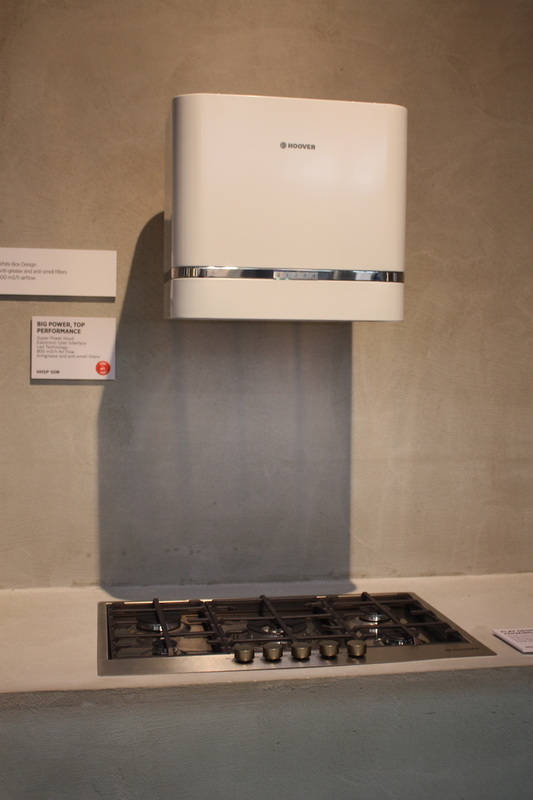 Grundig’s narrower wall-mounted model is well suited to a small, narrow kitchen. 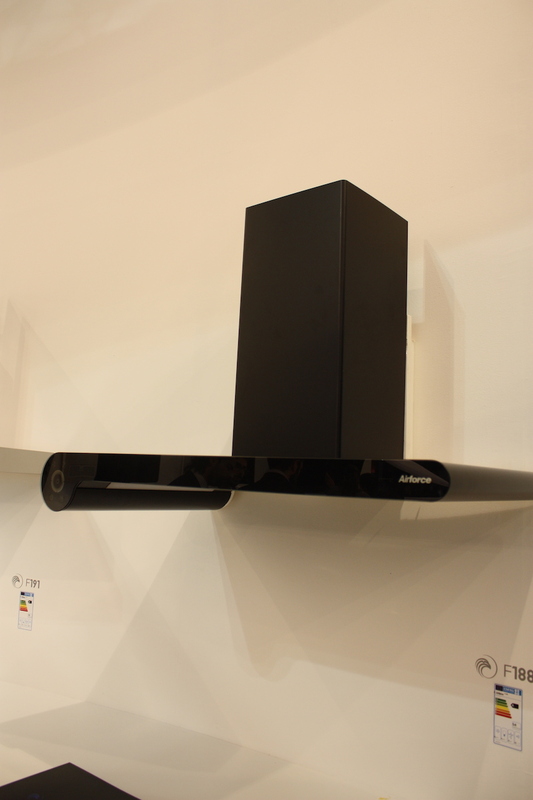 Hoover’s ductless model is powerful and compact, with a modern, minimalist look. 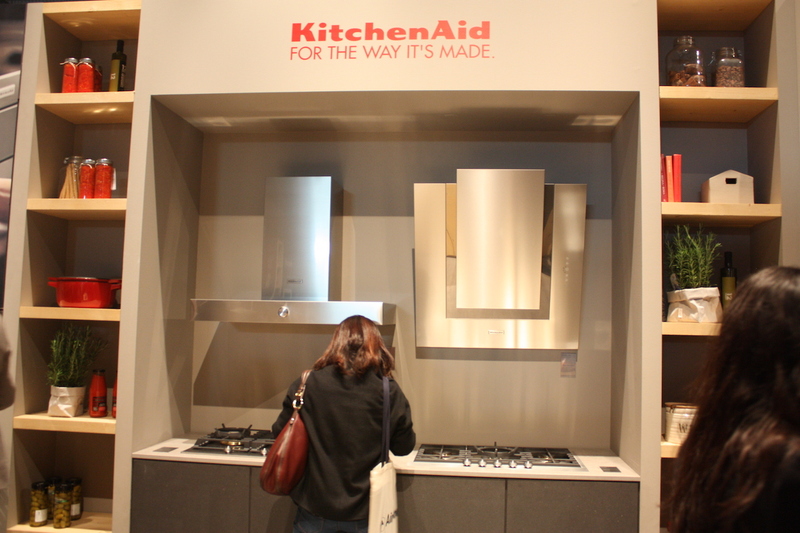 Kitchen Aid showed off their low profile wall-mounted hood next to a more traditional hood style. 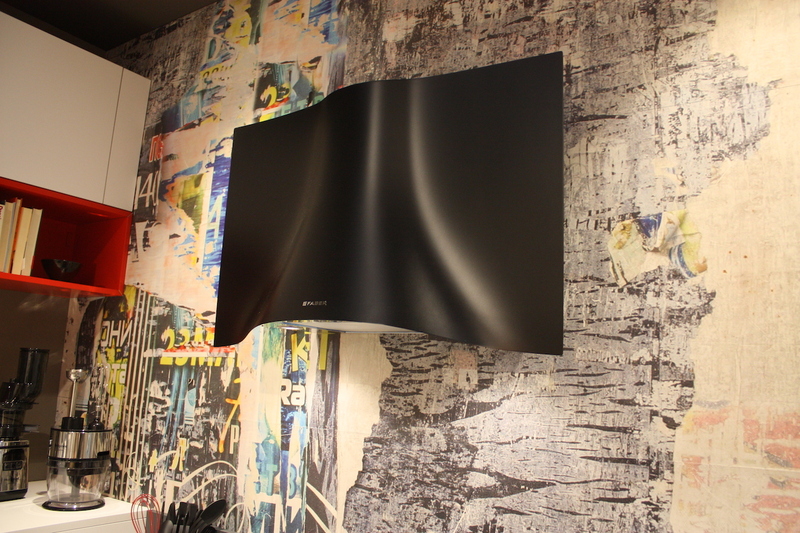 Not all wall-mount hoods have to be low-profile. 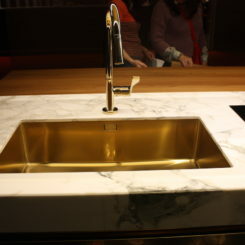 Nobilia displayed Faber’s gorgeously gilded boxed dual vented hoods in its stand. 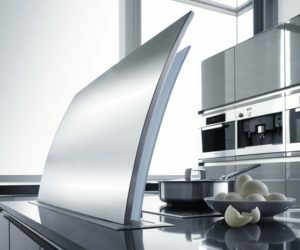 For a modern and colorful twist, Best range hoods have a wall-mount, vented model that will be a focal point of your kitchen. The flattened funnels shape is interesting and eminently functional. Best offers the same colorful style in a ductless model, that still offers the same touch control technology. 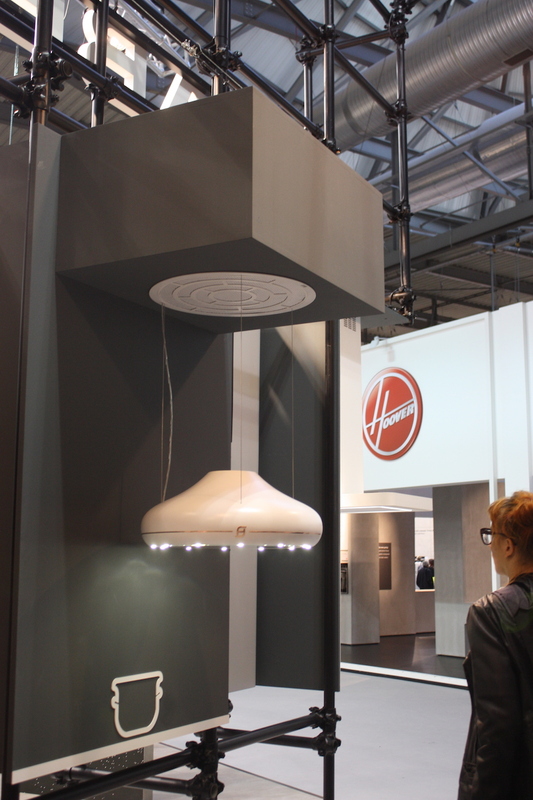 Faber presented a similar flattened funnel shape, but with a elegant elements. The hood’s vent and and bottom edge are trimmed in a fantastic high-shine coppery metal. 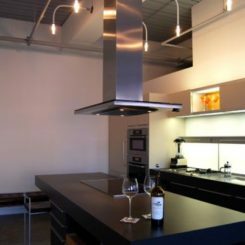 Modern and metallic, kitchen hoods with an industrial feel were shown in modern, contemporary as well as more traditional settings. 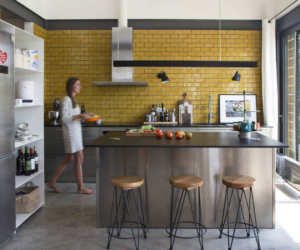 No matter the style of decor, the edgy feel of these kitchen hoods mixes well to make an interesting kitchen design. 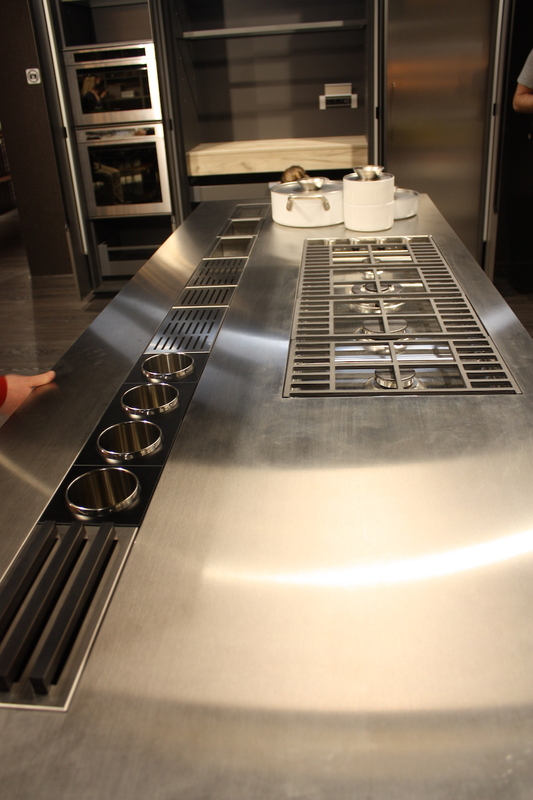 Creo Kitchens showcased this industrial vented tube hood over a more traditional gas cooktop, which would be equally stylish over a new induction cooktop. 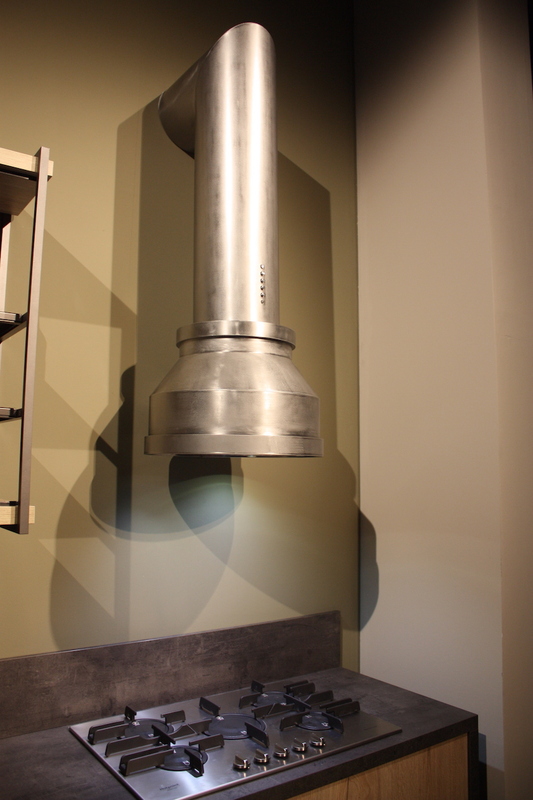 ernestomeda’s dual vent tubes have an industrial feel, but are paired with a shiny, stainless steel hood base. They come together in a very modern style. 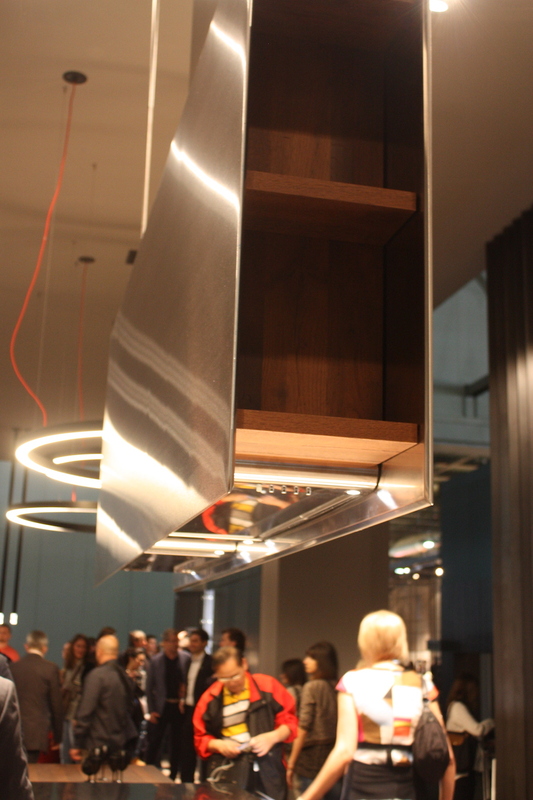 Italy’s Scavolini also showed a dual tube, industrial style range hood. 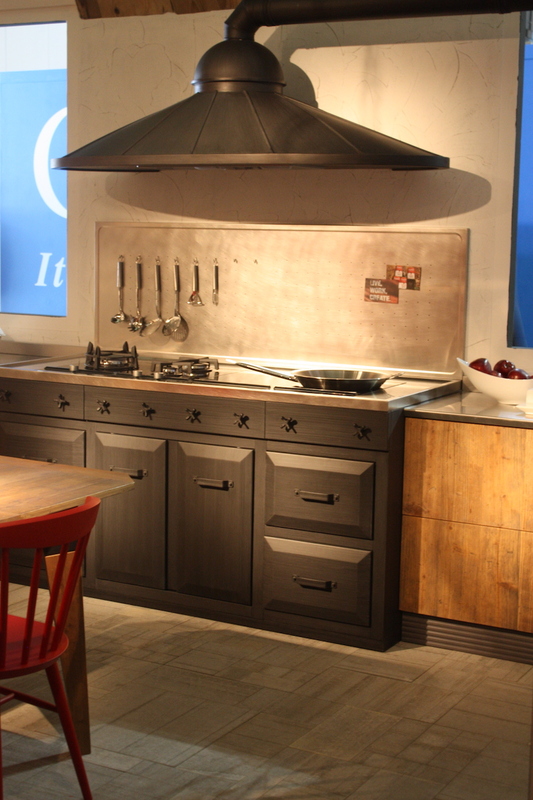 This style would be an excellent focal element in any style kitchen, over a counter or an island. 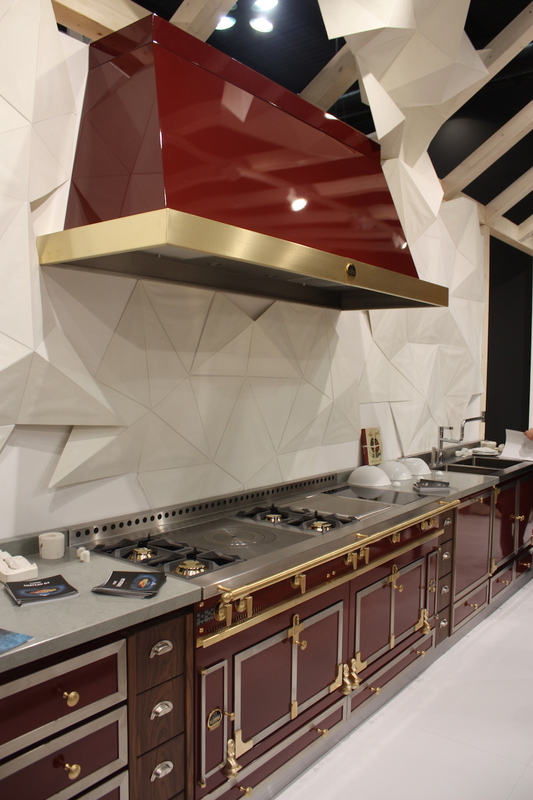 This large, imposing vented kitchen range hood was a dramatic focal point in the Nobili display at Eurocucina. 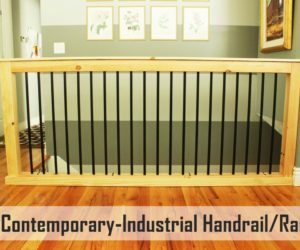 Even with it’s industrial look, it would be great in many kitchen styles. 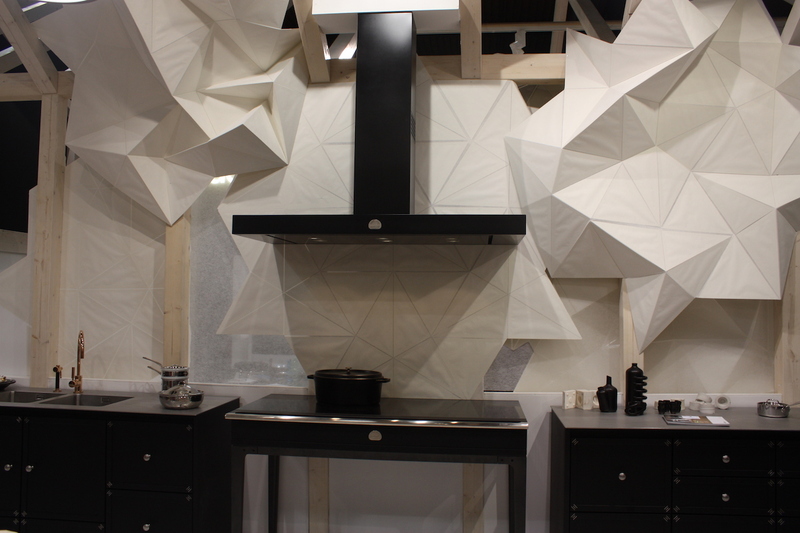 This large range hood from Marchi Cucine is more of a traditional shape with an industrial vibe. 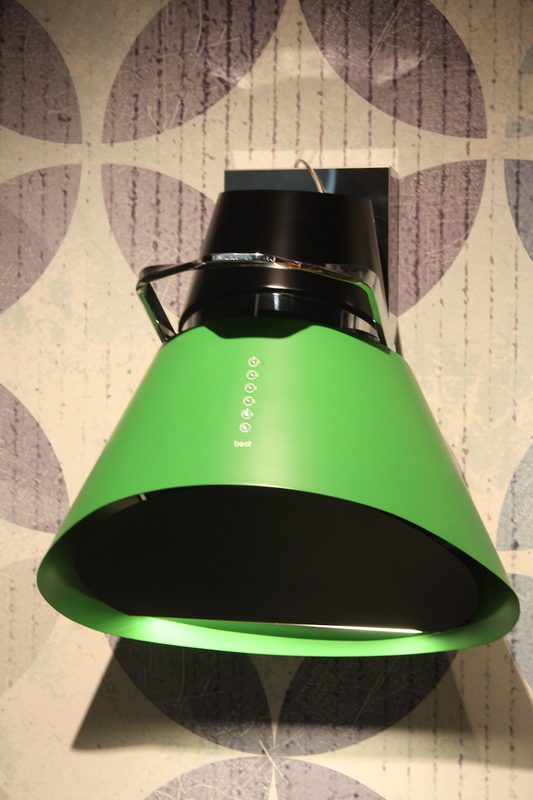 The showerhead-style hood and interesting vent detail is very cool. 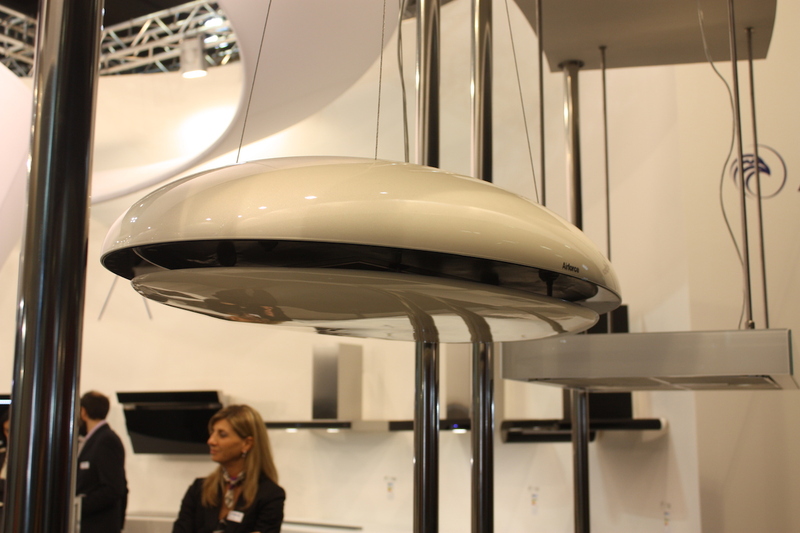 Marchi also showed this metal hood. 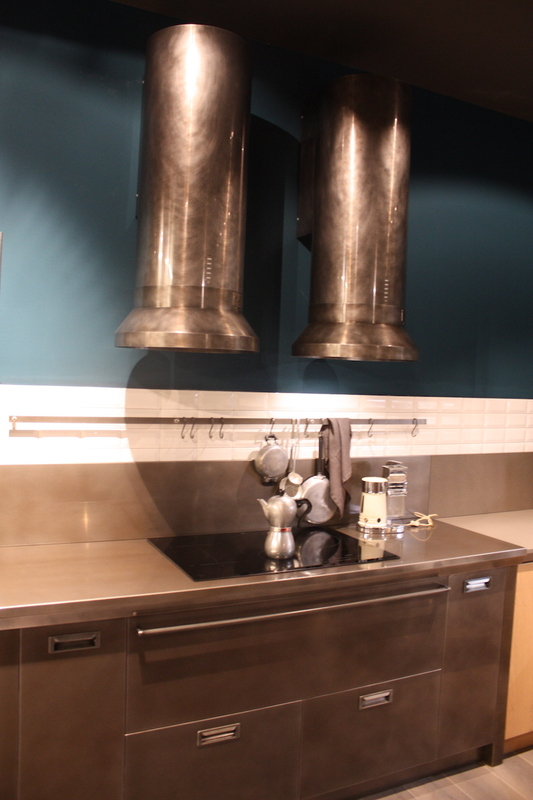 The scalloped edge tones down the industrial feel of the kitchen range hood, which makes it very versatile. 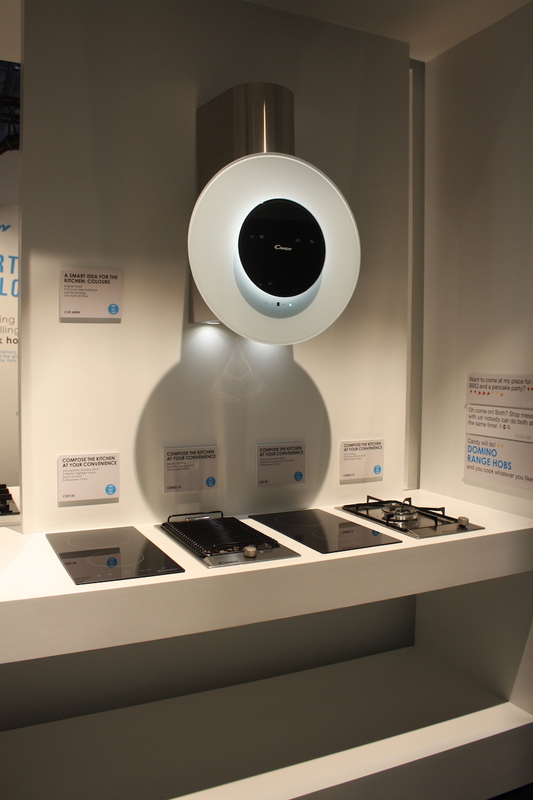 Brands have upgraded the traditional shape of kitchen hoods with new technology, materials and design elements. 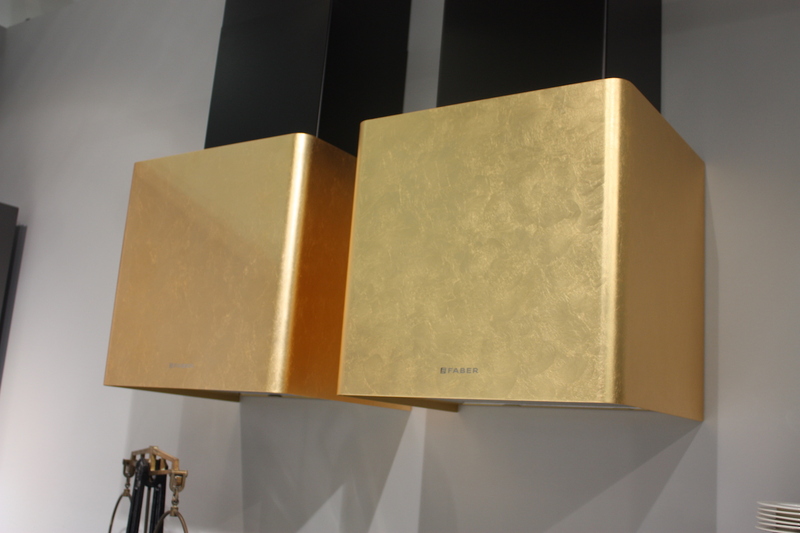 No matter what your kitchen style preference, there’s a new range hood that will provide not only function but fashion to your home. 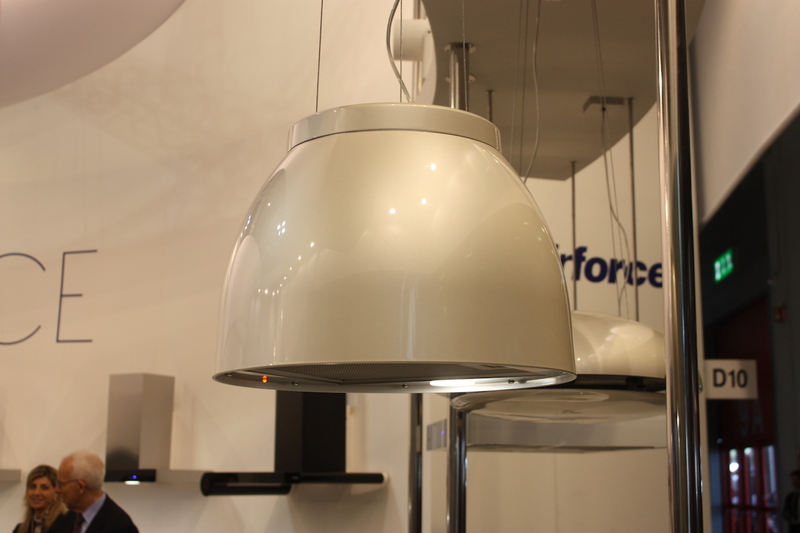 The Airforce F188 range hood has Touch Control for six different fan speeds, as well as a heat sensor for automatic functioning, a timer, light, and intensity adjustment. 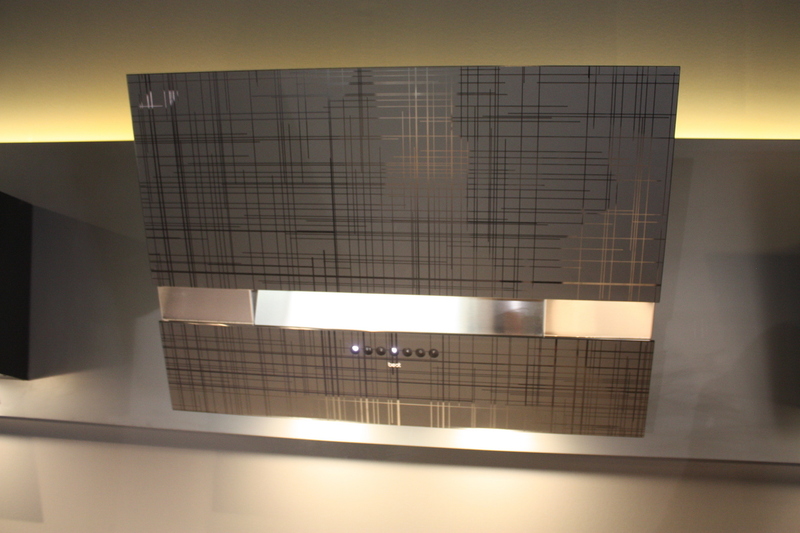 Here’s a close-up of the F188 kitchen hood’s minimalist touch control, stylishly located at the end of the unit. 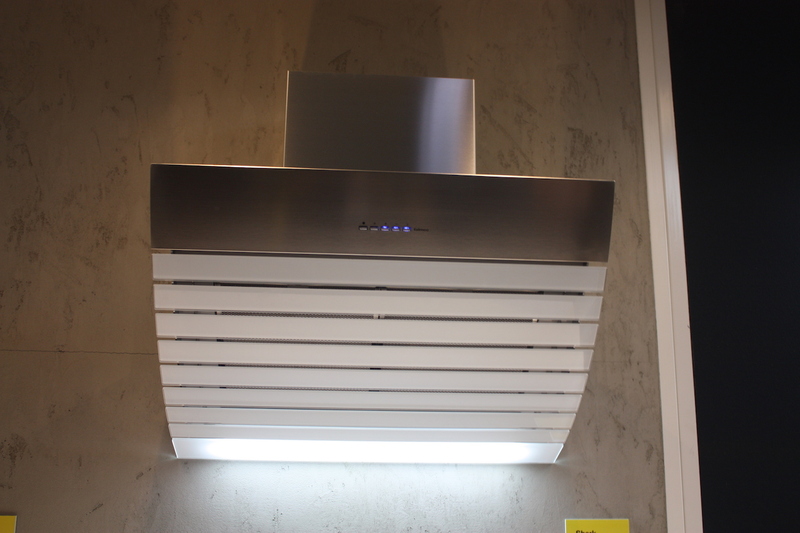 This range hood model from Complex is more traditional, but includes new lighting that illuminates the entire hood are, which is offset from the vent, situated at one end of the unit. 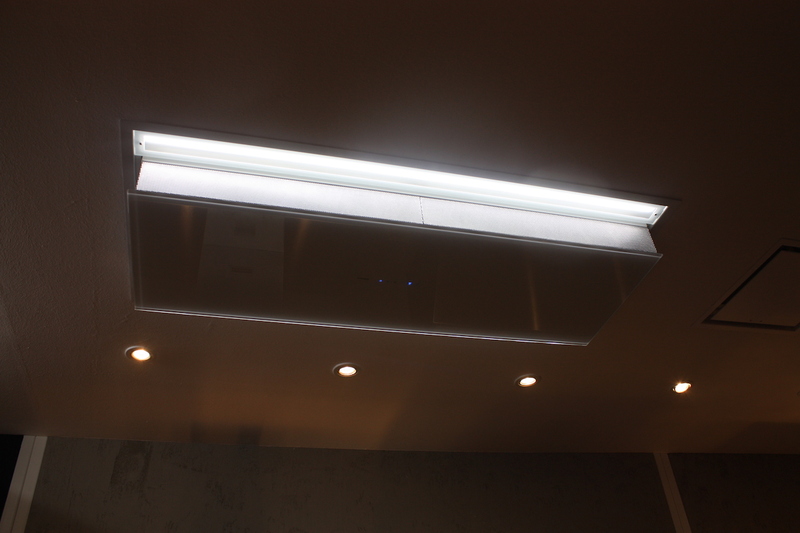 This allows the range hood vent to be located right above the cooktop, while the remainder of the unit is extra useful thanks to the extended lighting. 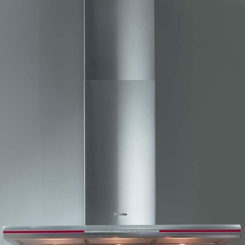 Elica’s stainless steel range hood is traditional in shape but has an modern glass component that elevates the design. 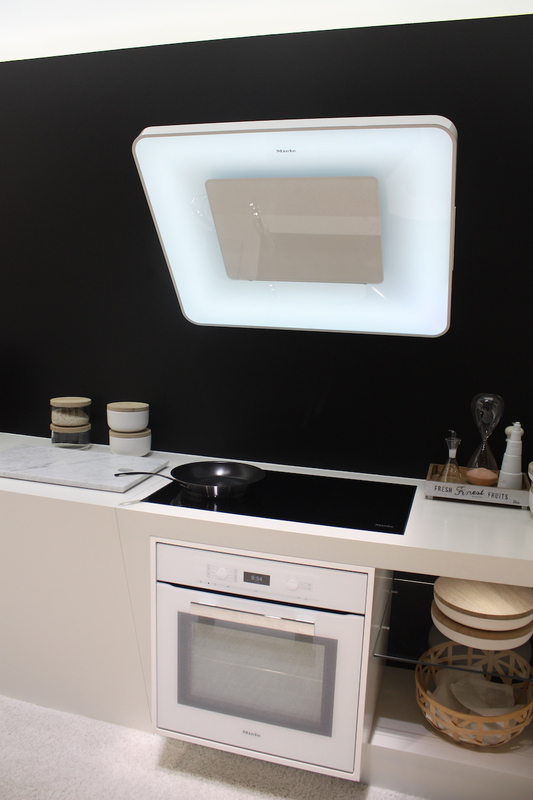 In another kitchen hood design, Elica has included LED lighting in strips along both sides of the vent component. 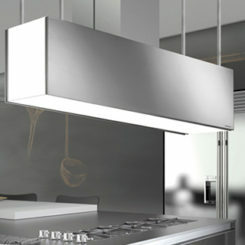 Wolf has also added a glass element to its stainless steel hood for an island. The mode includes multi-speed blowers, bright LED lighting with dual settings, and front-mounted controls. 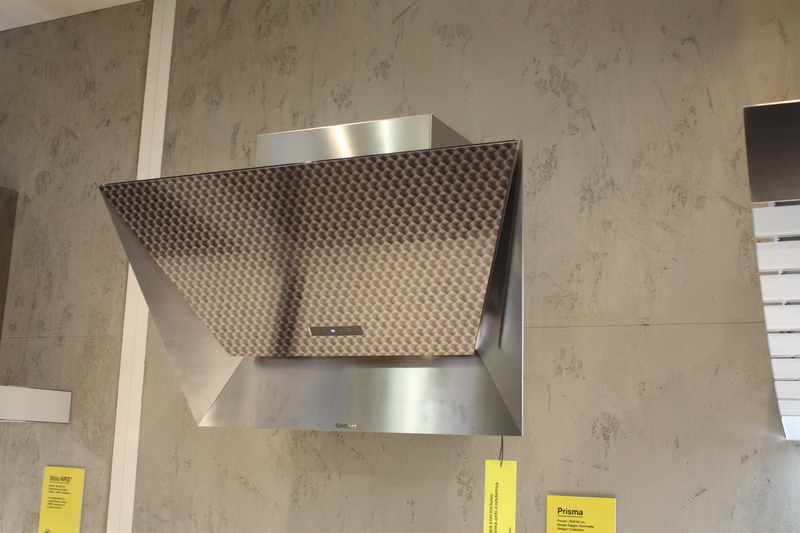 This wall-mounted kitchen hood from Ar-Tre has sleek, contemporary style with all the technology you would expect from a new kitchen vent. For the traditionalist, La Cornue is a great choice. These beautiful kitchen range hoods are made in the classic style by a company that has more than a century of craftsmanship history. 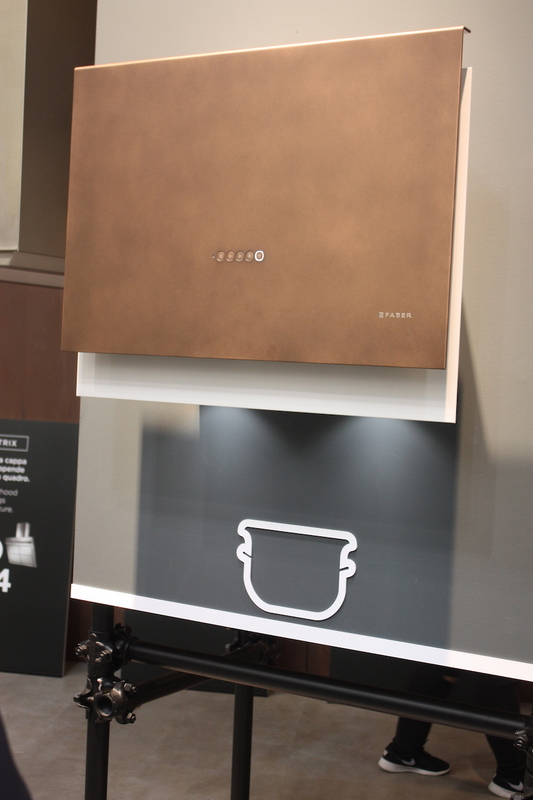 In addition to all the minimalist, modern kitchen hoods that Elica presented at EuroCucina in Milan were these beautiful traditionally styled “Sweet” models that come in three metallic finishes: silver, copper and gold. 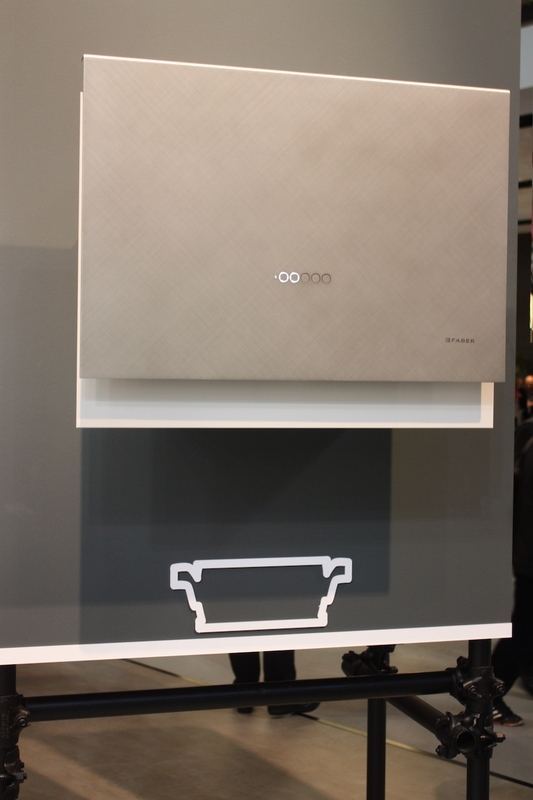 For traditionalists who like custom details, Arcari exhibited a number of kitchens including this beautiful range hood with exceptional metal detail. 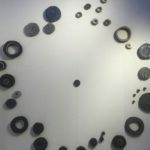 It is from the Pienza collection. 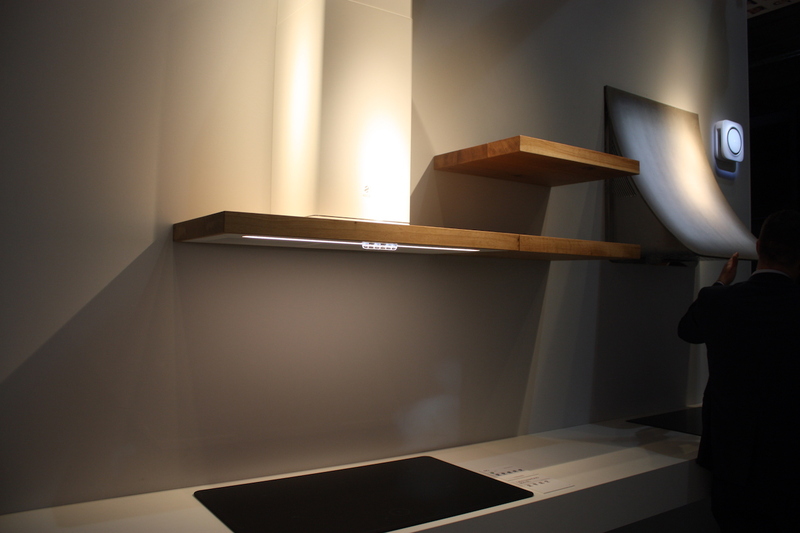 Even wood enthusiasts have a modern kitchen range hood choice! 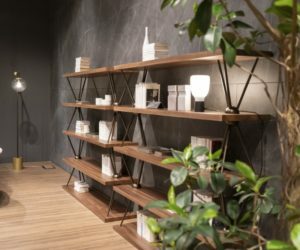 This model from Elica combines the latest technology with the warmer design touch of natural wood. 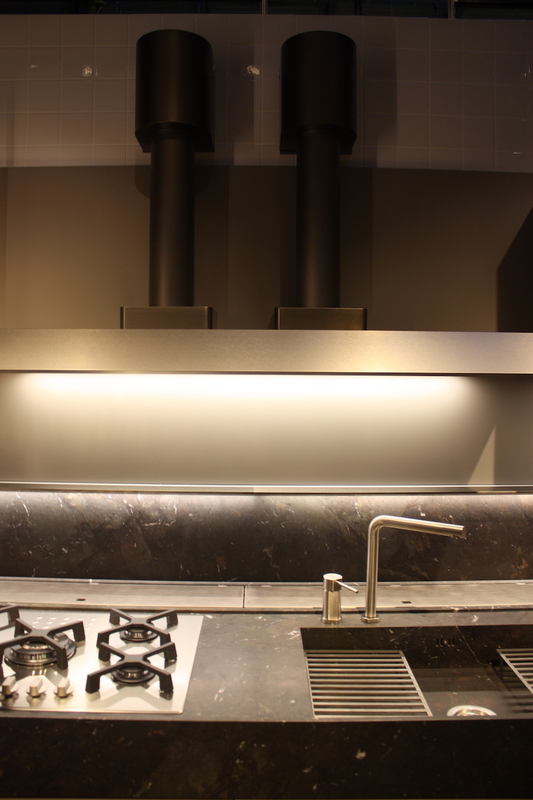 From this vantage point you can see the LED lighting incorporated into the kitchen hood, the low profile of the venting controls, as well as the offset vent style. 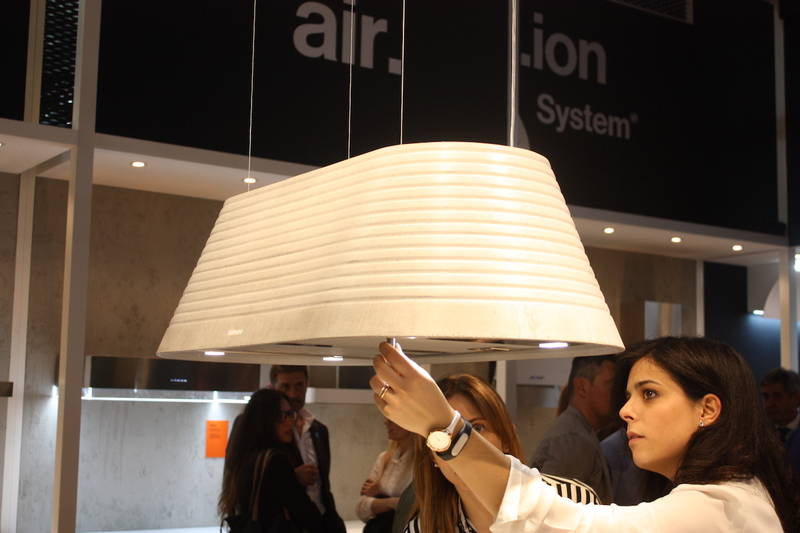 Indesit exhibited this model that is among the best kitchen hoods for a high ceiling. 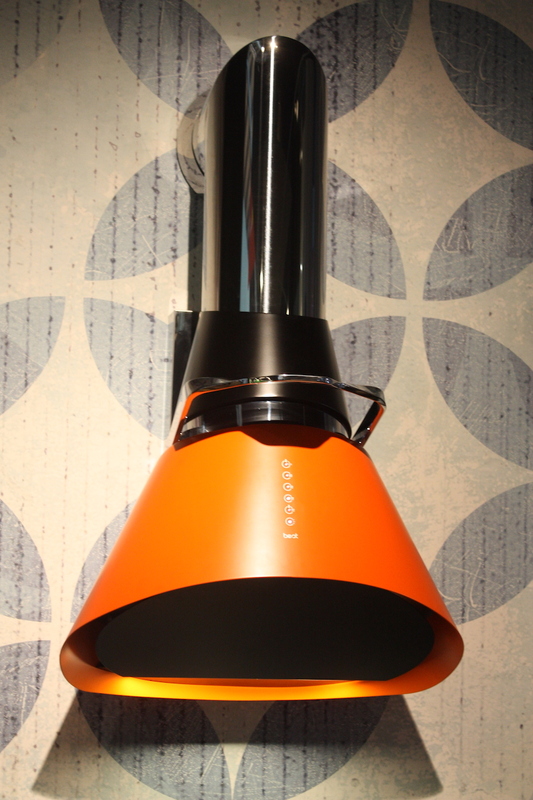 The long vent extends stylishly from the modern hood to the ceiling. This modern style might seem like a surprise from the traditionalist lines of La Cornue, however it is still made with their solid craftsmanship. 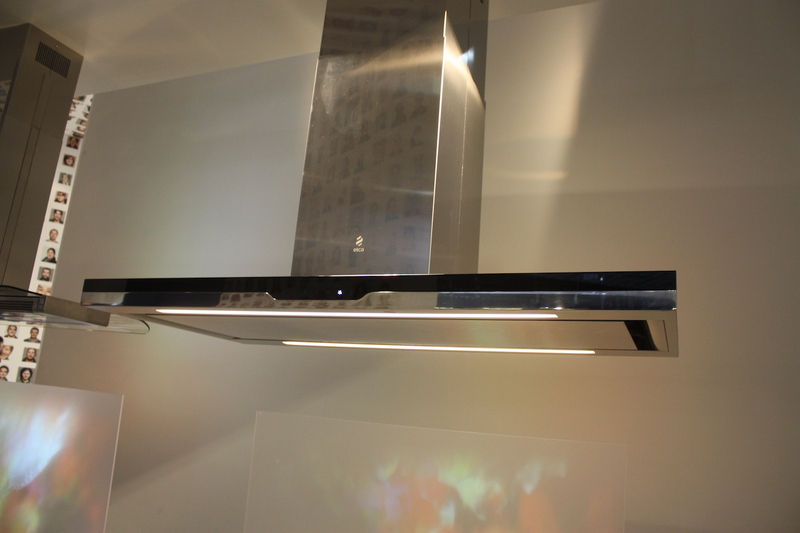 From the La Cornue W Collection, the minimalist range hood is made from tempered glass and lacquered sheet metal. 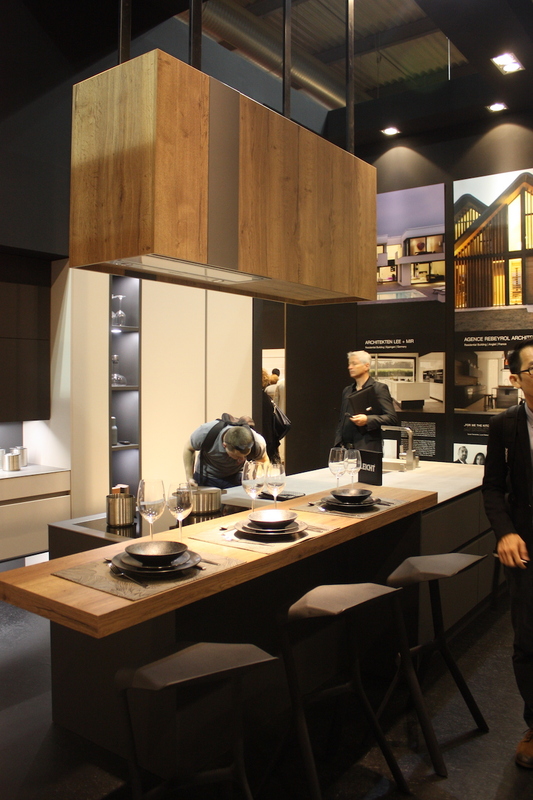 Another kitchen hood made from wood was shown by Leicht. 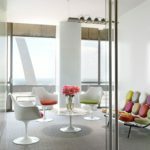 In includes lighting and ventilation in a warm, homey design. 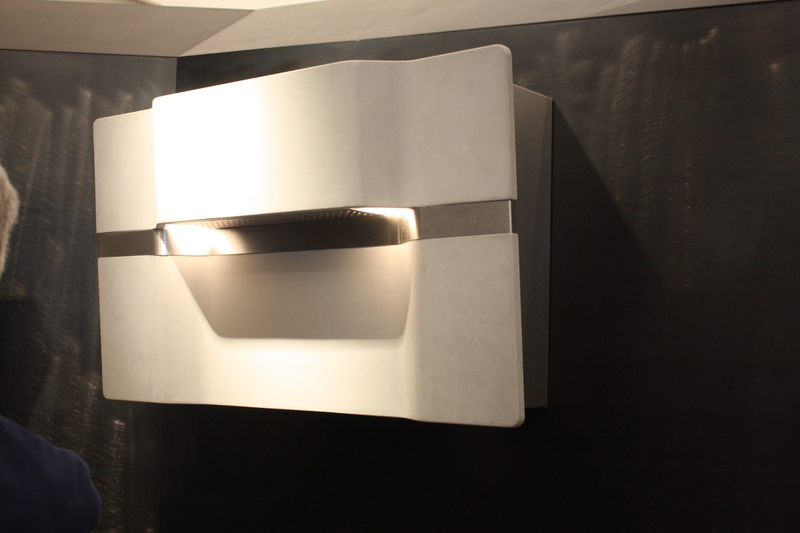 The same box shape with a very different vibe is this stainless steel range hood shown by Valdesign. 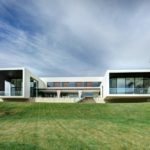 It too includes lighting and ventilation, but in a minimalist and modern style. 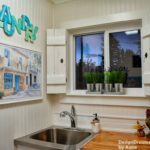 Kitchen ventilation is a must for any cooking area, but that doesn’t mean that every homeowner likes to look at large kitchen hoods. 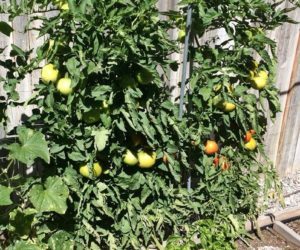 For these people, there are new options for kitchen ventilation that is nearly invisible. The only indication that this is more than just a cabinet is the small glass touch control pad that extends minimal from the unity. 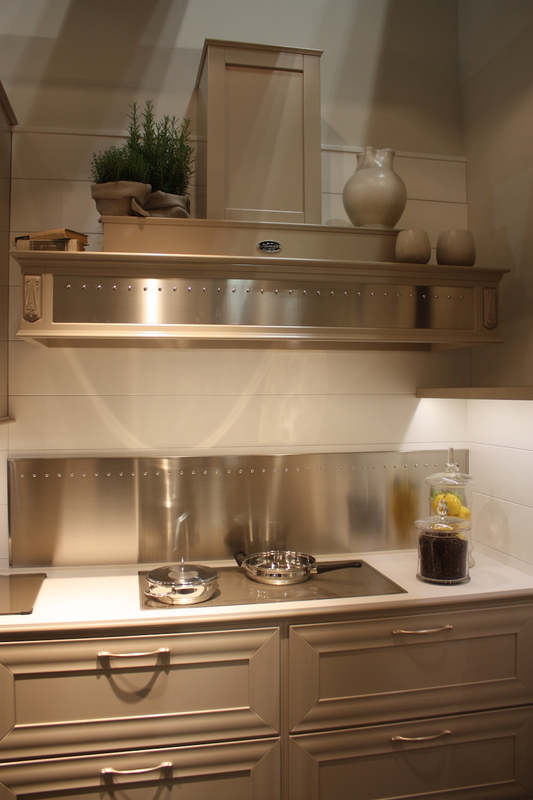 Best Range Hoods demonstrated this under cabinet kitchen hood that is practically invisible. 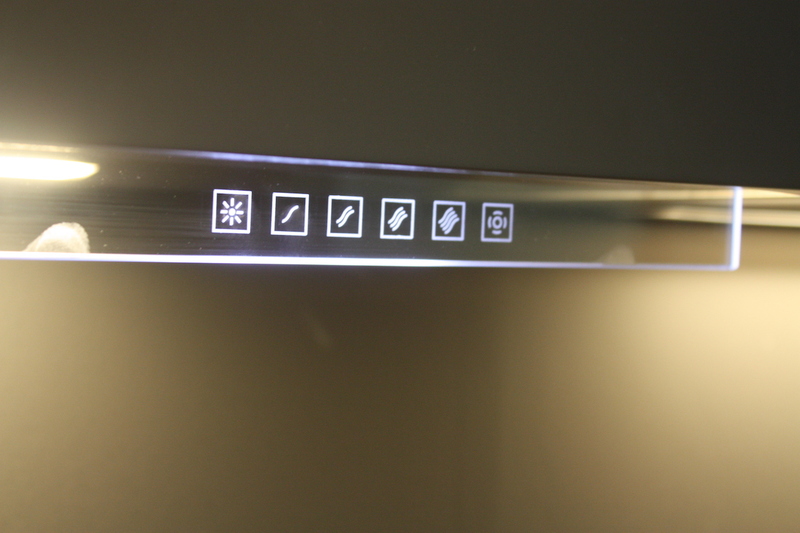 A closer look at the glass control panel reveals that you can do everything you need from that small, unobtrusive unit. 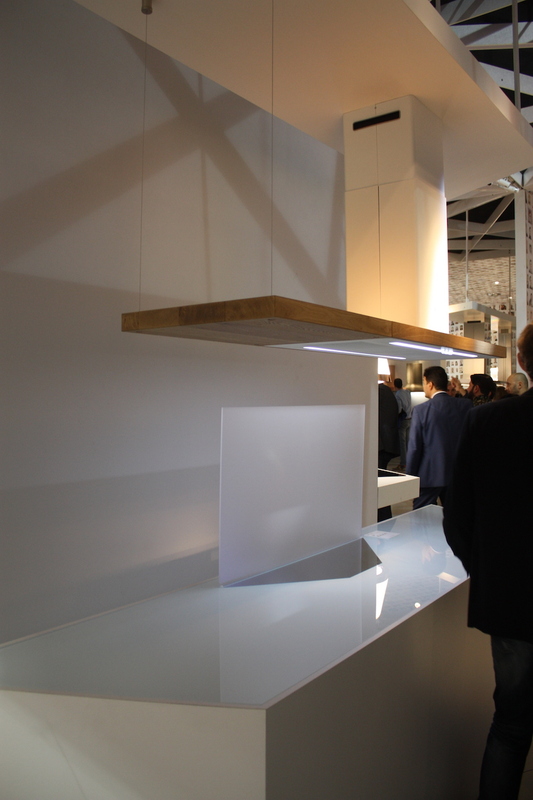 Faber also presented a range hood that is for all intents and purposes invisible. 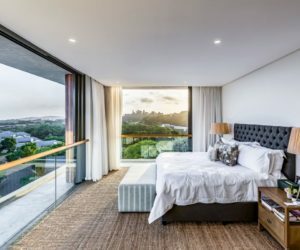 With the touch of a finger, the glass panel slides out automatically, opening up the ventilation unit. When not in use, it slides back into place. 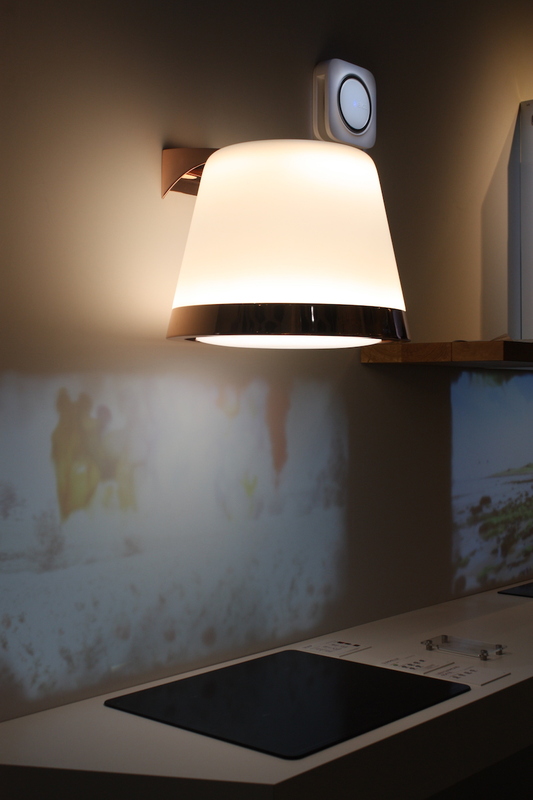 This view of the extended, lighted glass panel shows how unobtrusive it is even when in use. 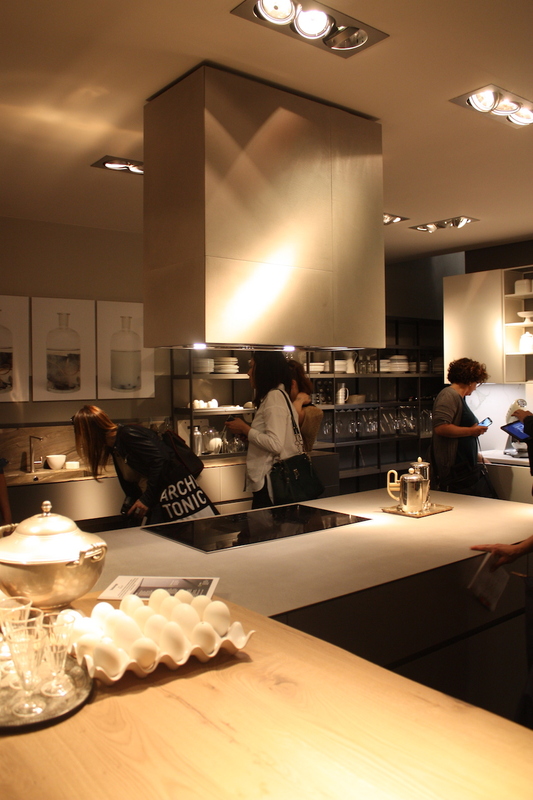 The range of kitchen hood designs presented in Milan was overwhelming. 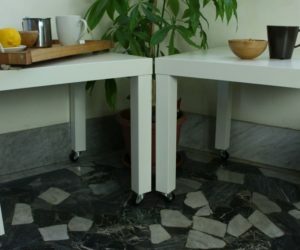 Design and technology for these often overlooked kitchen appliances has evolved to the point where they are just as stylish (and integral) as any other kitchen element.